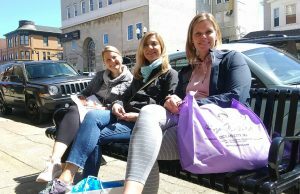 Dede Rothman and two of her close friends stopped to take a break in between shopping on a sunny and mild Saturday in Ocean City on Girls Weekend. Rothman, of Mechanicsburg, Pa., Beth Chadwick, of Lancaster, Pa., and Keirsten Kassel, of Carlisle, Pa., have been friends since high school. They do not let life, or miles, get in the way of their excursions to the Jersey Shore. They stay with a friend who has a home in Ocean City and make a long and unforgettable weekend around the featured event. Girls Weekend translates into discounts on boutique-style clothing, jewelry, shoes and more, as well as special offers at eateries. They strutted, they sashayed, and they certainly sizzled. It may not have been a Paris fashion show featuring the latest haute couture, but Ocean City’s best put on its version with a lot of the glitz and glamour. Combining laughs with “oohs and aahs” and applause, Ocean City’s fashion show at Glazed Over Studios, 704 Asbury Ave., had business owners, residents and even City Council members sporting snazzy threads. The fashion show served as a grand kickoff to the Girls Weekend celebration that is expected to bring scores of visitors and residents to the downtown shops and eateries, where they will be treated to discounts on merchandise and dining. From the education world, to the financial field, to finding her Zen as a well-loved yoga instructor, Suzanne Chew jokes that she has done it all. Her business, Yoga Ginger, opened five years ago in April, marking a milestone for the instructor with a welcoming down-to-earth smile who began teaching yoga in people’s homes in 2010. Suzanne built up a loyal following and in 2014, when a storefront became available at 717 Asbury Ave., she jumped at the chance. 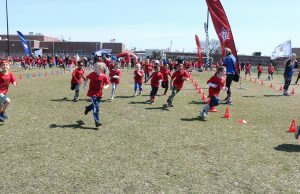 Ocean City Primary School students went the distance – literally – Thursday in the district’s first Fun Run Fundraiser, raising an estimated $9,000 for matching grants and class trips. From pre-kindergarten to third grade, the students raced around the field while music played in the background and Principal Kathy Smith, PTA members and others kept the kids excited about the event. The object for the children was to run or walk as many laps as they had sponsors for. The back of their T-shirts showed a circle with lap numbers. Some were checked off up to the entire 35-lap event while others were somewhere in the middle. 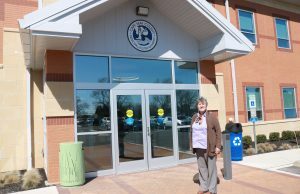 When Cape May County Recycling Coordinator Linda Crumbock visits a school to teach students about recycling, she does her best to leave a lasting impression. The jovial and friendly former Verizon project manager, who performs in a band on some weekends and is a local performer throughout Cape May County, strums her guitar and sings tunes for audiences. She takes that level of creativity and energy to the classroom to show students, or rather sing to them, about the importance of recycling and how it is a way to protect and preserve the future. Crumbock takes her show on the road traveling to primary, elementary, intermediate and high schools throughout Cape May County. 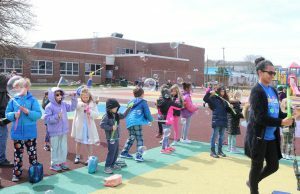 Ocean City Primary School students got an extra treat during recess Tuesday. They got to wave a giant wand, make big bubbles and watch them float in the air. They did it as part of Autism Awareness Day, which kicks off National Autism Awareness Month. 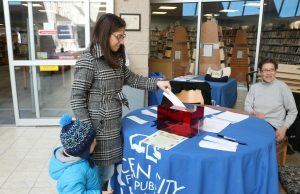 Autism awareness groups have been at the forefront of helping people understand autism, explained Lorraine Baldwin, a learning consultant for the Child Study Team in the Ocean City School District, whose grown son has autism. 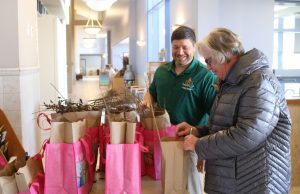 Women of all faiths from Ocean City and the surrounding area gathered for a one-day women’s conference Saturday that organizers say definitely forged new bonds and strengthened old ones as they listened to an inspirational featured speaker. 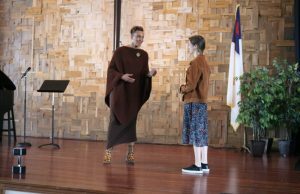 The conference, titled “Living on Purpose For Him,” centered around connecting women through Christ and God. The featured speaker, Veirdre Jackson, an award-winning educator, entrepreneur and spiritual advocate, kept the audience engaged throughout three sessions. Her focus was strength, authenticity and renewal. 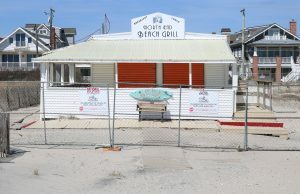 The Northend Beach Grill, tucked in the powdery sands in the upscale Gardens section of Ocean City, will once again provide great company and good food for locals and visitors, the owners said. Owners Angelo DiBartolo and Jim Aller were forced to shut down the beloved eatery, nestled between mammoth houses and a nearby dune line, when a fire broke out July 20, 2018. “Our intention is to be open the weekend before Memorial Day. We are excited to be back,” DiBartolo said Wednesday.